This entry was posted on Thursday, January 12th, 2012 at 05:45 and is filed under Campaigns, Election 2012, GOP Candidates, Mitt Romney, News, Politics. When you run into people whose utterances contradict their previous actions, you’re wise to ask which will matter to you in the long run. If somebody break every promise to you they’ve ever made, at some point, you’ll start ignoring their promises. If one lives by crony capitalism in the real world, but offers to you a long diatribe about the evils of crony capitalism, you’ll quickly point out any hypocrisy, and the contradiction will necessarily ruin one’s credibility. It is therefore impossible to overestimate the destructive contradiction that now consumes the heart of Mitt Romney’s campaign. He is now out campaigning in South Carolina, and is actually talking about the dangerous trend of the United States toward becoming a social welfare state. This from the man who imposed Romney-care on the entire state of Massachusetts, complete with mandates? The monstrous contradiction between what he now professes as a danger and what he has implemented while Governor of Massachusetts is going to destroy his candidacy, and Barack Obama will be only too happy to help. You might dislike Ron Paul, and like me, you may think he misses the point on foreign policy and national defense, but one thing you can say about him is that he’s more or less consistent across the board with respect to his actions and his philosophy, whether we agree with it entirely or not. That’s one of the things people find attractive about him, and whether you agree with his philosophy will largely determine how you regard him, but the test of consistency is to examine one’s actions, and see how they hold up to one’s professions. Ayn Rand once wrote approximately that “to the consistent will go the victory(paraphrased. )” The reason this is so is because people have a natural dislike and distrust for hypocrisy and inconsistency. Even when one disagrees with the particular views of another, if one sees that the other is at least consistent throughout, it is easier to offer grudging respect on that basis. Mitt Romney has no such virtue, as his current pronouncements on the welfare state show, since he was quite willing to expand it and propagate it when the opportunity presented. This is why the media and Obama can’t wait to see this man win the nomination: Inconsistency is a campaign killer, and Romney’s self-contradictory statements on this and other issues have already doomed him. The problem is that because his opponents have little cash to spend on revealing his inconsistencies to a wider audience, at this point only politically attentive people are aware of this impending doom. Worse, by the time the greater body of the electorate is paying attention to all of this, if nominated, Romney will finally have an opponent who will make this case plain with unfailing acuity in a general campaign. This is something about which every Republican voter ought to be terribly concerned, because what it means is that if Romney goes forward as the nominee, his opponents will absolutely dig up every bit of this to make a mockery of him. You can complain, and you will cry foul, but this is precisely what Obama’s campaign will do, and it will be on every late-night show, and you will see it, and there will be no escaping it from the moment the Republican convention ends until Obama is laughing it up on his way to a second inaugural in November. I hate to be the bearer of such pessimistic thinking, but that’s what is likely to happen if you nominate Mitt Romney, and apparently everybody in the country except Republican primary voters to date seems to know it. Of course, part of this is that Romney is moving right for South Carolina, and to try to wrap up this nomination, but the problem is that what you don’t realize is that what sounds like conservatism now will be tossed overboard the moment a general campaign commences. 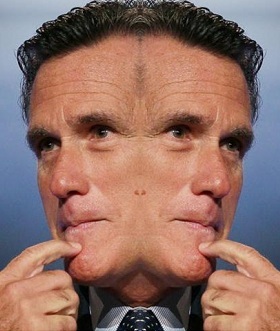 Ask yourself not “what does Mitt say,” but instead “what has Mitt done?” He will move back to his slightly left-of-center position for the general, and if he somehow manages to defeat Obama(but he won’t,) he will govern from the center, and we won’t fix one damned problem confronting this country. Of course, that assumes he’ll win, but since he won’t, let’s stick to the subject: Contradictions of the kind now consuming Romney are bludgeons to be used against him by his opponents. My strongest suggestion to other Republicans seeking the nomination is to figure out how to highlight Romney’s contradictions, and mock him publicly for them. These things are coming anyway, so it’s best to show them to voters now when they can still change their minds. Nothing will demolish a candidacy faster than to have its self-contradictions exposed, and Romney has them by the truckload. Great article as always. Thanks for all the information you put out. Love your writing…..please don't stop.